After a brief hiatus, the CTG Employee Spotlight is back! 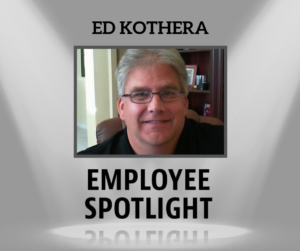 Next up is Ed Kothera, Senior Account Manager at CTG. As of April he’ll have been with the company for seven years. What’s your favorite part of working at CTG? Describe a funny or interesting experience as a CTG employee. My nickname “Ed no pants”…it came about while attending my first CTG Christmas party in Atlanta. Coming from Florida, I wore shorts on the plane, and when I was checking into the hotel it began to snow. “This Florida boy don’t like snow!” Hence the nickname! What do you think makes CTG stand out from our competition? CTG was built and is run by engineers…larger companies today are run by the stockholders and lawyers. Everyone at CTG rolls up their sleeves and gets their elbows dirty! Anyone who knows me, knows I am the #1 Jaguar fan on this planet!!!! Anything else interesting about yourself that you’d like to share? I am a Master Tailgate Chef in training.